This part of my life is back in Charlotte North Carolina, 1989. Click thumbnails to see photos full size. Use your back button on your browser to return. 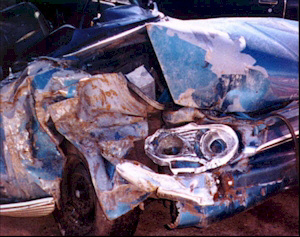 I was hit head on by a drunk driver! This was my second Corvair that I ever owned, a1964 Corvair Monza 4 speed. For those of you that don't know any thing about the Corvair, it is a rear engine car that was only produced from 1960 - 1969. I put about $8000.00 into this one to bring it back to life. All I had left to do was put the door handles back on. 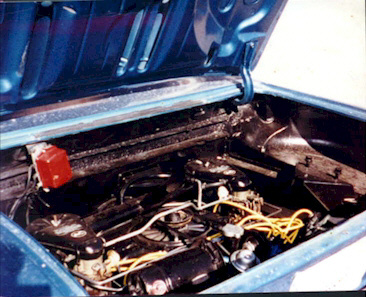 All the work was done by me with a little help from my Corvair fanatic friends. I got talked in to putting it in a car show and got 3rd place and it was not even finished. Here is another angle. 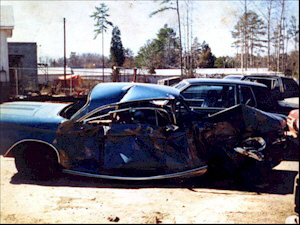 These where taken about 2 weeks after the wreck by a friend of mine. The truck is in the front of the car. For some reason on this one I put one of those old jacks that you use to put under the bumper to change a tire with between the front of the car and the fire wall. That's why there is minimal damage to the front of the car.Don't ask me why I did it, I don't know. But I am glad I did. I never did it to any of the othere ones I have owned. There was a girl in the car with me at the time. I was out of commission for abut 4 or 5 months but she got the worst of it. The doctors said that nether of us should be here today and that I saved her life. They say I was a hero but I was not even thinking at the time, I just reacted and thank god I did all the right things. I can't take credit for that. 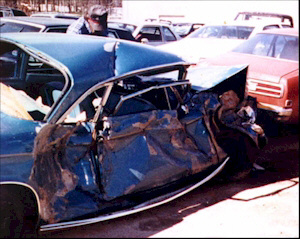 There was not much left to salvage even though the motor looks fine in the photo below, the rear axle was driven right threw the motor. After I got all healed up I went out and bought another one. A 1966 that I started on from the ground up with help from my fanatical Corvair friends once again. I have the restoration on video with the motor all torn a part. I have this one you are looking at on video also but most of the footage of it is after the work was done to it. I had the motor bored out 30 over and it would run at 90 miles an hour in 3rd gear with no problem. You could let go of the wheel and it would stay straight as an arrow for miles. The thing was like new. As you can see I put all the original stickers and marking back on the motor. And almost every part was new as you can see. 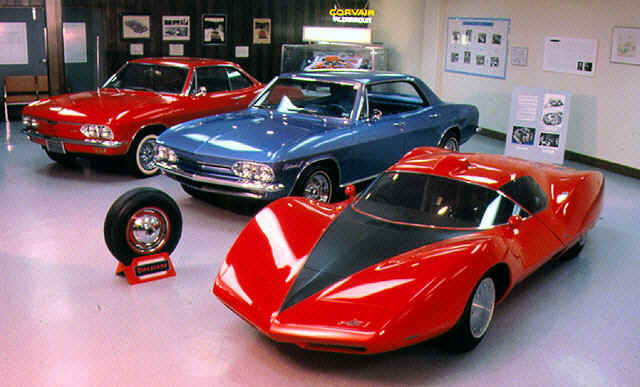 I could tell you more about the Corvair then space or time will allow me here, so if you are interested in learning more, than use the links below.